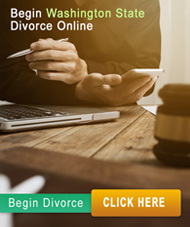 Washington Divorce Online is a service created in Washington State that allows you to complete your official Washington State Petition for Dissolution of Marriage, commonly known as divorce, online. In Washington State divorce, if the spouses have a minor or dependent child or children, the court will enter a Parenting Plan that designates where the children will be every day between the time the divorce is finalized and when the child turns eighteen.The court will designate one parent as the primary residential parent. In most circumstances, decision-making for the children is made jointly between the parents. The Parenting Plan can be prepared to fit the unique needs of your family, and no one knows those needs better than you and your spouse. You and your spouse are best qualified to create a Parenting Plan best suited for your children’s needs. If you and your spouse have a child or children who are under 18 years old or otherwise dependent, then the court will require that a Parenting Plan be entered with the court in order for you to finalize your divorce. If you have been served divorce papers that include a Proposed Parenting Plan with which you disagree in any way, then you must prepare your your own Proposed Parenting Plan to file with the court. A Final Parenting Plan must be entered with the court in order to finalize your divorce. If you and your spouse cannot agree on a Final Parenting Plan either on your own, with the assistance of attorneys, or through mediation, then you will have to go to trial, and the judge will make the decision for you. What happens if I don’t follow the Parenting Plan? A Parenting Plan signed by a judicial officer and entered in court is a court order. If you and your former spouse agree to make a change, for example, if you exchange emails and agree that instead of returning the kids at noon, it’s okay to return them at 3:00 p.m., then that’s fine. However, it’s best to have these agreements in writing. If there is not agreement to change, then the Parenting Plan must be followed. If you intentionally disregard provisions in the Parenting Plan, then you may be found in contempt of court. This is very serious. If you want to make changes to the Parenting Plan and your former spouse will not agree, then you’ll need to go to court to get the Parenting Plan changed. This is not an easy thing to do. This future possibility is yet another reason why working hard to resolve the outstanding issues in your divorce in an amicable way is so important. What are the reasons why Washington courts may limit my time with the children? If these reasons do not exist, then a court will very likely grant joint decision-making to you and your spouse. Additionally, the court will provide for both parents to have quality time with the kids. It is also important to know that if a parent is found to falsely allege any of the above factors about the other parent, then that parent may end up having their time limited with the children. © Copyright 2006-2012. All Rights Reserved.